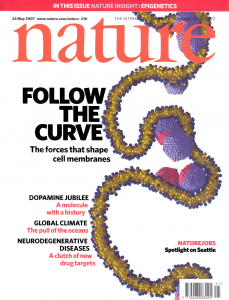 Nature Cover Issue from 2007. The data in this article was produced with ESPResSo. ESPResSo is a highly versatile software package for performing and analyzing scientific Molecular Dynamics many-particle simulations of coarse-grained atomistic or bead-spring models as they are used in soft matter research in physics, chemistry and molecular biology. It can be used to simulate systems such as polymers, liquid crystals, colloids, polyelectrolytes, ferrofluids and biological systems, for example DNA and lipid membranes. It also has a DPD and lattice Boltzmann solver for hydrodynamic interactions, and allows several particle couplings to the LB fluid. ESPResSo is free, open-source software published under the GNU General Public License (GPL3). It is parallelized and can be employed on desktop machines, convenience clusters as well as on supercomputers with hundreds of CPUs, and some modules have also support for GPU acceleration. The parallel code is controlled via the scripting language Python, which gives the software its great flexibility. ESPResSo is used in scientific working groups all over the world both as a production platform as well as a research platform for developing new algorithms and methods for coarse-grained simulations. It is mainly developed at the Institute for Computational Physics of the University of Stuttgart, but has contributors from all over the world.